Since 2012, the largest producer of oil and gas in the world has been the United States, and its lead is growing. The balance has shifted in the last ten years. US production now easily outstrips Russia and Saudi Arabia where the output has not increased much for the last decade. There’s a little shift in geopolitical freedom — “thanks to shale”. Warms my heart to see some good trends for once. The underlying logic….Look at me,…. Look at me….. i have fifty five mortgages and i am still buying new homes, that makes me a mortgage superpower…for example. “As oil prices have declined, the number of bankruptcies and distressed oil majors has quickly risen into the dozens. In fact, a recent Reuters analysis suggests little effect on production from when companies enter bankruptcy. Reuters cited Magnum Hunter as a primary example of this reality. While Magnum Hunter filed for bankruptcy in December 2014, the firm has scrambled even in Chapter 11 to keep its oil flowing, resulting in O&G production rising by roughly one-third between mid-2014 and late 2015. The firm has used the protection bankruptcy courts to help stave off creditors while keeping the pumps flowing full tilt. Nearly all of Magnum Hunter’s 3000 wells are still producing crude, and that makes sense for several reasons.” …………..
Just over half a trillion dollars: that’s how much cash oil industry companies will need to repay in maturing debt over the next 5 years. Specifically, according to BMI Research cited by Bloomberg, there is $72 billion in oil-related debt maturing this year, $85 billion in 2016 and $129 billion in 2017, and a total of $550 billion in bonds and loans through 2020. Darn…this was meant to be a bottom post. Not a reply to Mark D as originally intended. Half way through my reply to Mark D i was overcome with the realisation that i had to post seperately. Sorry about that Mark. I usually skip the top couple of posts. That’s where trolls hang out. was that an attempt at irony? You callin ME a troll?! Will a couple of commentors around here please make up their bloody minds! We have the same commentors often in the same post, gleefully describing in bold print, the downfall and bankruptcy along with the numbers of small entrepreneurial companies in various industries that have taken high risks and failed or are bankrupt or close to it. We then have the same commentors decrying and lamenting at the size and power of large corporations and demanding that they be penalised and taken down so as other corporations and small companies can “compete”or gleefully describing their financial and industry travails. So just what do those particular commenters actually want in the way of corporations? Do they want many and varied small highly entrepreneurial companies that are resource limited and only have a narrow industry focus, nearly all of whom will ultimately fail or be absorbed by another corporation? Or do they want very large corporations with access to enormous financial and physical resources who will dominate an industry and / or be a leading corporate component in many industries. Or do they want a mix as happens in real life of large and small companies and corporations. If they want this latter mix then they have to accept that this is capitalism and many, many companies, corporations and industry groups will fail or be taken over by other corporations and companies which they themselves will also one day just fail or fold up or be absorbed by another later corporation. Of course if the same commentors are Marxist in their ideological outlook then we understand their confusion! ROM i agree it is a question that needs to be carefully masticated before being ingested. Ellen Brown, a very qualified person on the matter, in part, says this…. Our money system is not what we have been led to believe. The creation of money has been “privatized,” or taken over by private money lenders. Thomas Jefferson called them “bold and bankrupt adventurers just pretending to have money.” Except for coins, all of our money is now created as loans advanced by private banking institutions — including the privately-owned Federal Reserve. Banks create the principal but not the interest to service their loans. To find the interest, new loans must continually be taken out, expanding the money supply, inflating prices — and robbing you of the value of your money. Not only is virtually the entire money supply created privately by banks, but a mere handful of very big banks is responsible for a massive investment scheme known as “derivatives,” which now tallies in at hundreds of trillions of dollars. The banking system has been contrived so that these big banks always get bailed out by the taxpayers from their risky ventures, but the scheme has reached its mathematical limits. There isn’t enough money in the entire global economy to bail out the banks from a massive derivatives default today. Well I guess we will all just have to go back to carting a bucketful of shells around to buy and barter with. That should end the money problems. But then no doubt, the Ellen Browns of this world will accuse the banks of using 3D printers to make even more shells so as to control the shell market. … the banks of using 3D printers to make even more shells so as to control the shell market. The banks won’t do it directly. To mask what they are doing, they will create a shell company. ….. but it is pretty obvious that most trolls are found in the first few of posts of a thread. Its an attention seeking thing. A dry leaf should avoid the ironing. Your attempts are flat, as usual. They got their just deserts. It was just a pyramid scheme, anyway. No problem Mike, GeeI will take care of me. For exampole…. Anyone, or an entity that owes trillions of dollars is owned by the creditor, in effect. Where’s the problem in owing trillions of dollars? Those creditors are supposed to write off the debt if we can’t afford to pay. Isn’t that what we did with the bank, auto and other bailouts? Just write it off and start over. Yes it’s a good feeling for a change. But then why are places like California still acting like energy is harder to find than a chicken’s teeth? Maybe more to the point, I’ll accept any decent bid from anyone who wants to buy a worthless governor and state legislature. I’ll even throw in the state capitol building with it’s “gold” dome. And to sweeten the deal even more, you can have the whole city of Sacramento if you want it. It’s certainly not doing us any good. I won’t bother to ask why Obama still wants to bankrupt the coal industry — and every other energy producer except solar and wind. Come to think about it, I’ll take bids on the Golden Gate Bridge too. The toll booth is a money maker for sure. Raise the rates a little and get rich. But you have to rename it. This isn’t the Golden State anymore. So with just Russia, Saudi Arabia and the US producing 64 million barrels of oil equivalent a day, it is up to little Australia to reduce CO2 with Malcolm’s secret carbon tax. What sort of black humour is that from Turnbull? Qui Bono? (Who benefits?) Hint: It’s not about the CO2. “It’s not about the CO2.” could it be an old fashioned Multiplier Effect designed for a certain market? It could just an old fashioned fraud. Ok. I knew that word would be moderated. Who does the US export too? I guess they can put them on ships and park them at sea for a return route. They have massively cut production due to low prices and closed many wells weekly. The Fracking has added the benefit of poisoning well water supplies and many people can light a match to their water and some lakes. You’re showing your ignorance. You may want to do a bit of studying on the subject. A year ago I was fortunate enough to spend five weeks in Canada, most of it in Alberta. Everywhere we drove on magnificent highways we saw oil and gas wells next to the highways which also support the gas and oil pipelines. Nowhere did we hear any adverse comments to the fracking and production of either oil or gas. Electricity is down to 8.5 cents per kWh and fuel less than a dollar per litre. In contrast we have a Greens led campaign, unfortunately strongly supported by broadcaster Alan Jones, against gas exploration and open cut coal both giving us cheaper power and providing well paid jobs. The amount of disinformation surrounding this campaign would make Stalin proud. If the Greens are supportive then beware. As for the gas in water con we now know that the water in the film “Gaslands” contained gas long before the introduction of gas wells and fracking. The gas bubbling from the Condamine river has been doing so forever apparently due to fault lines extending to underground coal seams. The problem here is the lack of real journalists. You may have heard ; the ones that ask questions and who also question answers. It’s annoying, it’s aggravating, I currently pay an average of 30 cents (US 21) while in the most comparable country it’s ~US 8.5 cents and no-one seems to be able to explain why. Gary, the ships are waiting for Greece to put in an order. You forgot the /sarc tag. But then I guess that you’re aware that these are such wild, grossly exaggerated and completely unfounded assertions that you didn’t think one was needed. Itself, huge LNG ships load up on the Gulf coast and export (go from port) to Boston, to supplant gas pipelines, in northeast winter. Gas pipelines are to expensive to build and maintain for peaking loads! Go Local Nuclear! The duck curve can be preprogrammed! methane enters water used for household supplies at levels relatively close to the surface. Oil and natural gas wells are drilled several orders of magnitude deeper through layers of impervious rock, which caps the reservoir, far below the water table by several thousand metres. Fracking in these wells does not pollute private water wells. The private wells are far too shallow. And the oil/natural gas well shafts are lined to prevent the escape of valuable fuel. I hope you didn’t think the drillers just let it escape. Fracking is all about breaking up very deep capping or blocking rock to direct the flow of oil and gas up the drilled well with little, if any, waste. Methane in the domestic water supply is a natural pollutant in some parts of the world and in some parts of the United States. You might find this article illuminating about how it happens. Here is a natural phenomenon in western Queensland. The local green member lit the methane to make a fracking statement, which only impressed the brain dead. People have been lighting the artesian bores for decades. It’s nothing new. The one in Winton I believe was rather spectacular. One purpose of pumping cement down the casing/liner and up between the formation and casing/liner is to isolate formations from the surface, and from each other. Casing is high pressure rated seamless steel (usually) pipe of varying tensile and torsional strength, which comes all the way to surface (or seabed), and liner is the same type of pipe, but it stops at some other point in the well. Casing/liner segments are referred to as ‘joints’ and are typically 12-14m long, with diameters commonly ranging from 30 inches, to 2-7/8 inches (wth a lot in between) and wall thicknesses of more variation than I care to note here. Each joint has a threaded coupling on each end (male ‘pin’ on lower end, female ‘box’ on the upper end) to join them together at a predefined torque. A system of simple plunger-type non-return valves (casing/liner shoe) on the end of the casing string allows fluid to go down, and out, but not back again, as the cement slurry is typically more dense than the fluid which is left in the casing, so the inherent hydrostatic imbalance would lead to u-tubing without these valves. 2g/cm3 is within the range of typical cement slurry densities. - failed casing shoe/float collar valves or plug seating (cement u-tubes back inside the casing). However, such failures are not common, and remedial work is possible on the rare occasions when it is required. Cement itself is a complex mix of cement (API class G – portland cement is often used), water, viscosifiers, thinners, fluid loss preventers, de-foamers, gas migration blockers, weighting agents, retarders (slows setting time, e.g. calcium or sodium lignosulfonate) or accelerators (hastens setting time – e.g. CaCl2), amongst other things. Well said and the process you describe was explained to me in Alberta by some drillers and a mining geologist. Is the same process of sealing the aquifers used here in Australia? Great blog James, very interesting and informative. it’s good to see actual engineering/geological facts placed on public record, but Cassandra predicts that most people will, sadly, ignore it. This is the type of information the MSM, particularly the regional outlets, should publish but will not. Exciting and unrelated lighting of bubbling water with unscientific claim trumps 3 minute factual explanation. ‘Swamp-gas’ has been around literally forever and is not a product of fracking and that same water catching fire amused generations of Americans before fracking began. Now, fictional Hollywood movies have…. Its actually quite easy to link a bottle of propane into your cold water supply to the kitchen tap and put a match to it for the camera. If water comes from a dam it just cannot contain gas. So many sources of underground water already contain natural methane that comments like the above have to be quantified to be believable. Nice graph Jo. What many in the US and elsewhere do not realize is that the increase in US production is a fraction of its potential. Most of the increase in US production has come from private lands in the US. There are vast tracts of public land locked up by our leftist government. If a fraction of this public land was opened for production, the oil and gas production in the US would soar. This and the Obama depression are hindering increases of energy in the US. But the Obama depression and the violation of the intent of federal laws to permit exploration/production on public land may be changing in the near future. The irony of this is that the US uses its sources of energy, oil, gas, coal, uranium, whereas here in Australia we export most of it in one form or another and are a net importer of petroleum products, and as TdeF says, slap a carbon tax on our electricity production. As well we pursue expensive and totally ineffectual green energy policies which will make not an iota of difference to anything. Something about the lunatics running the asylum isn’t it? My preference is to our ‘leaders’ being [[snip] less than capable]. Lunatic implies that there was a mind to lose in the first place. Obama takes 0.2 MPG fossil-fuelled flight to Asia, then proclaims his membership in the climate cult! Obama: if [Asian countries] “took the same development path that the west did, we’re all going to be under water“! Obama: If Young Africans Are Allowed Cars, Air-Conditioning, Big Houses, ‘Planet Will Boil Over‘! I love this blog gentlemen some good stuff coming out (great pun what?) Previously I have been concerned about the potential for fracking to cause pollution, (too much Allen Jones) but what some of you have said here has changed my mind. 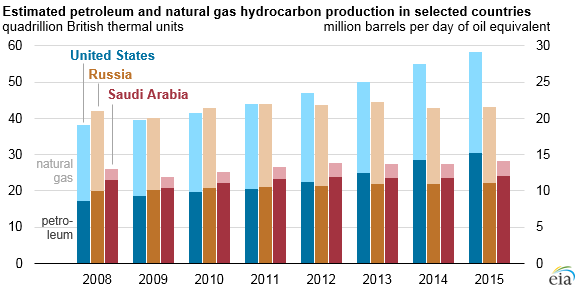 One last point-how does this gas and oil production not effect US emmissions in a negative sense? The energy sources it replaces are more CO2 intensive per unit of energy released. Gas fired has been substituted for coal fired electricity production. Thus less plant food release. If CO2 is meant, then the more the better, CO2 does not affect global temperatures as climate alarmists claim, it only increases vegetation. As dean says, it is plant food. Figures (rough) for CO2 kg per MWh generation. OCGT 600-700 (although a figure for 1000 for a plant in S.A. Switching from coal to modern coal fired lowers emissions, but coal requires almost continuous production. Intermittent generation from wind makes it less profitable. Switching to gas fired lowers emissions for the same amount of electricity generated. Unfoortunately the most efficient also requires long runs in production, although it can be ‘throttled back’ to a lower electricity output, but at the increase in CO2 output per unit of electricity. Where there is a carbon tax, ETS etc. this makes them less economical unless the fuel gas cost is low. In the USA gas prices have plummeted so gas is favoured and emissions drop. In Germany where there is even more pressure on cost, les than 2 year old CCGT are being dismantled and exported. To maintain backup Germany has to rely on brown coal so German emissions go up as the amount of renewables rises, and have been doing so sice before nuclear stations started being shut down. It is not hard to find the information. The word in general is in debt, not just man woman and child, also franchise, business, and corporation. Thanks to all who have written about the “pollution of water supplies” during fracking. Have been aware of the potential for damage to water supplies but I now feel a lot easier about it than before. It is always hard to judge from one expert but here there are a lot of sensible people giving a balanced assessment of the dangers of fracking and it seems they are less than originally thought. There is a very good commercial reason to prevent leakage from oil or gas pipes. It is abhorrent to investors because it is all lost money and oil and gas mean big money. So you can expect the engineering to be excellent and it is no surprise that there are no reports of real leakage. That does not mean planes will not crash and leakage and accidents will not happen, but they are extremely unlikely. Incidentally we are seeing the same with modern aircraft when a plane has crashed, it is now either the pilot or terrorism. Even planes with no engines have landed safely as with the crash in the Hudson river. Despite the predictable hysteria, fracking has proven to be very safe and there are over 1.1 million oil and gas wells in the US. You would have to be impressed with the technology. “By then it will be too late for many marginal U.S. drillers, who must drill into and break up shale rock to release oil and gas through a process called hydraulic fracturing. Fracking is significantly more expensive than extracting oil from conventional wells. Begs the question: who(s) control the price of oil? While I could be wrong, it seems they suddenly halved the price of oil, halved their own income, just to kill fracking. It worked, but why halve your own income? The logic is very odd and their move needs explanation, but as the biggest supplier, it worked overnight. Or was it to halve Russia’s income or to keep Shiite Iran poor? Or take control of prices? Or to demonstrate their power to collapse economies? Or all of the above? A low oil price is bad for capitalism, so everyone is breathing a sigh of relief now that its heading back to the safe zone. The other thing is that China’s operations in the South China Sea is considered by some to be military expansion, but in fact they just want to exploit the oil and natural gas reserves. Its a commercial decision which presumably goes against Australia’s self interest. The price of oil is governed by the same law that governs all transactions in an economy steeped in Usury…the law goes something like this………………………. If the price of oil is 10 dollars a barrel and can be purchased for cash by a buyer who has the 10 dollars cash, then the final cost of oil is always determined by who can borrow the most money. For example….If someone can borrow more than 10 dollars to buy a barrel of oil, 100 dollars for example, then the entity or borrower who can borrow the most money determines the cost of oil. The person/entity/collective that can only pay cash 10 dollars cash without borrowing misses out. In this example, the person who can borrow 100 dollars determines that the new cost is 100 dollars a barrel. Of course it is more creative than this example, but the principal law is the same. Who can borrow the most money will always outbid and finally determine the new price of houses for example and that this price is always greater than what a cash buyer is willing to pay.. If the credit of the borrower is downgraded in a usurious financial environment, all of a sudden, the price and creditworthiness of fish is downgraded, or, conversely upgraded to AAA risk free investment causing fish prices to increase. For example, i am hungry and have 10 dollars to buy some fish for dinner. Along comes some dude with a digital wallet and has 200 dollars credit. The dude postulates that he can pay for the fish later or get his kids to pay off the debt, so he goes the whole hog including the postage and spends the 200 dollars mortgage/debt limit on the fish and i miss out on dinner. Bugger about that…..
Ahahhahhaaahahahaha i think to myself because i can come back tomorrow and buy a different fish for 10 dollars, but by the next day the dude comes back with some freshly printed mortgage limits. If the lender by some miracle can see i am hungry and stop the flow of fresh money to borrow, the price of fish will come back to 10 dollar each, but the lender does not see my plight and continues to finance the fish buying borrowers with absurd credit limits. Triple AAA rated fish loans. 200 dollars per fish. No deposit needed and negative interest rates. Wow!! The fishing industry goes gangbusters,,,,, and this 200 dollar fish lending limit causes fishermen to over fish so that they can increase profits and so on… In the end, all fish become extinct due to the steroid effect of unlimited money printing in a usurious economic fishing environment. Peak fish is reached and everything collapses into rotten fish well away from sensitive noses. They might need $70/barrel to initiate the investment. But the variable costs of the process are small, which is why they keep producing at low prices. They might not repay capex, but they sure as hell are making cash. And if they can seek protection from creditors during Chapter 11 processing, then all the value of the company is in the revenue stream, of course they will keep producing. They will not be replacing reserves, but ultimately this is fine, they will simply reduce supply to a more sustainable level. A pattern emerges… If it %4&%$^@ like debt, #*&$% like debt, it’s probably debt. “A corporate bond is a bond issued by a corporation in order to raise financing for a variety of reasons such as to ongoing operations, M&A, or to expand business. The term is usually applied to longer-term debt instruments, with maturity of at least one year. Very important point. A corporate bond is basically an IOU/IOY (I Owe You) …. It is a promise to pay. In todays modern money mechanics, these are the debt instruments OFTEN CALLED “TAX PAYER MONEY” in the case of an Austrtalian bond or an American bond. The government or corporation goes to the central bank window and both parties goe empty handed. The central bank at this point does not have any money. The government or corporation only has a “bond” in its pocket. The moment of money creation is when the IOU?bond is handed across the counter to the central bank and the central bank magically with the press of a few computer keys creates a credit to the ledger of the corporation or countries account balance. When the money is repayed, it simply disappears or is uncreated. The ledger is zero again. From the above article again……. BONN, Germany, May 25 (Reuters) – Russia set itself at odds with a drive by China and the United States for rapid ratification of a global agreement to slow climate change when a senior official said on Wednesday that Moscow first wanted a clear set of rules. Negotiating a detailed rule book for the 2015 Paris Agreement for shifting the world economy from fossil fuels could take years, in the worst case, delegates said at May 16-26 U.N. talks in Bonn on implementing the pact. Top greenhouse gas emitters China and the United States say they plan to join the Paris Agreement this year and almost all other nations say they will ratify as rapidly as possible -before the rules are in place. “The core issue to create the landscape conducive to joining is the development of the book of rules,” Oleg Shamanov, Russia’s chief climate negotiator, told Reuters. “I will be renegotiating those agreements, at a minimum,” Trump told Reuters in an exclusive interview last week, betraying an unfamiliarity with the UN’s consensus-based process. France’s top climate diplomat, Laurence Tubiana, agreed that Trump in the White House could do serious damage to the new climate regime. In Bonn, some negotiators have sought solace in the idea that public opinion would discourage Trump from reneging on the US commitment. “There’s election rhetoric, and there’s the real world,” said Elina Bardram, the European Union’s top negotiator. The Donald to the UN….Gentlemen, you all have no clothes on! comment #12 is in moderation. Germany is second on the list in overseas coal financing, having poured some $9 billion into coal-based power over the same period. Some 40 percent of the world’s electricity is powered by coal, roughly the same as 40 years ago, according to the International Energy Agency. Brussels 25 May 2016 – New analysis shows that energy intensive industries are able to reduce their CO2 emissions by over 80% while maintaining or even enhancing their competitiveness. The transition will require the introduction of smart public policies, including a reform of the EU Emissions Trading System (EU ETS), currently under negotiations. The report, Carbon Pricing Watch 2016, shows four new carbon pricing initiatives – in the Republic of Korea, Portugal, Canada’s British Columbia province, and Australia – were launched, or have been in the works, since 2015. In 2015, governments raised about US$26b in revenues through carbon pricing mechanisms like emissions trading schemes and carbon taxes, representing 60 percent increase from 2014. The total value of such mechanisms is currently estimated at just below US$50b, according to Carbon Pricing Watch 2016. BONN, Germany – Finding a workable compromise that allows a long-lived UN program to both reduce carbon emissions while also protecting the lives and lands of indigenous and impoverished people in the developing world ought to be an achievable goal, says John Knox. But CDM projects are not as popular an investment as they once were due to a market failure to establish a consistent carbon price, and the inability to develop a reliable market for carbon trading. In CDM’s heyday between 2008 and 2012, according to UN sources, carbon was valued at around $20 per unit. That valuation has now fallen to less than $1 per unit, causing wealthy nations to be less likely to support CDM projects. The Oil Borrowing Superpower (OBS). Like any boom and eventual bust, it all starts with confidence and optimism in higher prices, which spurs investment and speculation. This almost always leads to more spending while the debt just racks up, until supply eventually begins to overwhelm demand. Then, when excess supply drives down prices and leads to excess debt levels, the debt becomes unserviceable for the overleveraged, and you’re looking at a pretty big bust just waiting to happen. It isn’t all about fracking. In the US natural gas is the far more plentiful product. Natural gas production has increased exponentially in just last few years, not from fracking but from improved drilling techniques. Top among these are directional and horizontal drilling. When using these techniques only one drill site is required to produce scores of productive wells. They drill from one site to the pay zones all around the site. With only one location per drill rig, the impacts on the environment are minimal. Only one road needs to be built, for example. The impacts on the environment created by modern drilling are a tiny fraction of those created by wind farms, BTW. Once a well is drilled, the drill rig picks up and moves a few feet and drills another one. In days of yore one well was drilled to a hoped for pay zone that was perhaps a pay zone of maybe 300 feet in depth. There was a good chance it would be a dry hole, and all invested wasted. Now, geologists know where the pay zones are to very high probability. Once a pay zone is entered it can be accessed further by horizontal drilling. This can expand the pay zone from ONE well from say 300 feet to perhaps three to five miles. And each site can produce scores of wells. It is quite a multiplier effect. Only after the gas is extracted decades later can the crude that lies beneath the gas finally be accessed. Peak oil is a complete myth. Dave, that is one of the most prescient remarks on this site today, or on many days, come to that. That fact had escaped me, until now. I might let Allan Jones (radio presenter, anti fracking/coal mine agitator) know. In the UK there has been disquiet, so this is the first cab off the rank after years of malaise. Only the renewables industry can survive without subsidies! In my dotage the most puzzling item I now come across is the abysmal ignorance of almost all of today’s western populations of the role that energy, that today is very nearly unlimited in its availability and its inherent cheapness [ excluding pernicious governmental taxes and strictures against any energy production at any level ] has and continues to play in the development, continuation and advancement of what has become today, a universal and near global civilisation. It is true that my age is showing in how I think and regard my daily items and I am now light years away from the education system of today, but in my school years in the late 1940′s and early 1950′s the British Industrial Revolution of some two centuries years previously and those old engineers that brought the Industrial Revolution to its fruition were still something to admire and regard with awe. We were taught that the British Industrial Revolution was the underlying foundation on which so much of the advancement of our living standards, even those of the first half of the 20th century, were based on the Industrial Revolution and its coal mining and iron and steel and chemical production developments. Rarely said was that it was ENERGY, the ready availability of first really reliable ENERGY in the form of coal fired steam power and then later, steam power’s application as the generators of that cheap and incredibly adaptable Electricity that finally produced a form of energy that was usable and adaptable to every conceivable application mankind could and has dreampt up. Nowhere today do I ever come across any references or any education material today and even in the media, of the role and the importance to the development of our now near full global civilisation of today that the Industrial Revolution has played and the universal, utterly reliable and cheap Energy production that came about as a direct consequence of the Industrial Revolution of those two centuries ago. Even less so do I ever see or come across the educating and teaching of the utterly critical role that Energy of every type plays in the maintenance and continued functioning of today’s global civilisation. Instead amongst a very large percentage of today’s western populations, particularly those of a green bigotry, we see an almost complete and abysmally ignorant and arrogant contempt for energy production and energy producing sources along with a complete and abject unthinking and deliberately mis-informed ignorance that the role that energy of every type plays in their own lives and their own living standards. That abysmal and even deliberate ignorance of the role of energy in our civilisation can be seen in the outright and utter stupidity and abysmal ignorance shown by those who are intent on displacing our well proven, utterly reliable and extremely cheap sources of universal electrical energy that still powers our civilisation, with unproven, unpredictable, extremely costly, short lived and low output, low energy density sources of energy from wind and solar. Wind and solar sources of energy that even with a 3000 year long history of development behind them and after all that time as shown by the steam powered developments of the Industrial Revolution and its consequent accelerating and rapid development of a fast advancing civilisation, to be utterly incapable of providing the energy in the amounts or at a price and reliability that could have led to a similar advances in civilisation and in its population’s living standards if they had been at all efficient and universally useable, a couple of centuries prior to the onset of the British Industrial Revolution. Everywhere no matter where one goes except in the utterly warped and hubris and ignorance driven minds of a percentage of leftard western greens and politicals, people everywhere with any smidgin of knowledge of real world weather and conditions just get the hell out of extremely costly, utterly unpredictable and inherently very low energy concentration wind power and solar power as fast as they possibly can. They know just how unreliable and how unpredictable and how expensive such supposed renewable energy sources really are. And they try to get access to the reliable and cheap fossil fueled [ and nuclear ] generated energy sources just as fast as they can, just as our forebears did some two centuries ago during the Industrial Revolution. I regularly come across articles on fossil fuel energy sources that more often than not are full of foreboding and lamentations on how the world is running out of fossil fueled energy sources or they are becoming to expensive or are about to be controlled by some dictatorial entity that will hold the civilised world to ransom over the fossil fuel energy sources it controls. My reaction is to just shake my head in disbelief at the levels of intellect or lack of displayed by most of these often high profile opinion writers and commentators. They write learnedly about the American frakking of its oil and gas shale deposits and as we see in Jo’s headline post and the astonishing levels of production of fossil fuels now being achieved by Americans in what was supposedly a written off, aging and increasingly irrelevant in importance and influence, former leading hydrocarbon and oil producing nation. Those opinion writers seem incapable of ever extending their thinking beyond their tiny minds fixations with America and the current global hydrocarbon / fossil fuel production to the fact that shale deposits of immense sizes exist in most of the larger geographically sized nations. And the point they seem to miss entirely is that the frakking technologies being developed by the American frakkers and drillers are eminently transferrable, with localised adaptions to suit the local geology, to just about any of those shale deposits anywhere in any other nation. The consequences of the transferring of American frakking technologies to other global shale deposits and the potential output of gas and oil from the frakking of these shale deposits implies that the world and the energy dependent and energy driven civilsation that our forebearers began and we live in and continue on will not have a fossil fuel energy shortage in real terms, outside of gross political incompetence and ignorant and bigoted green scum interference in energy supplies, for centuries into the future. The borrowing superpower Strewth!! Wonder if here in Au the new government will make Au a great borrowing/mortgage superpower? Gawd…not again….. According to a separate study from consultants PwC, to meet the targets laid out in last December’s UN climate deal a tonne of CO2 should be rated at US$45, far higher than prices in major markets. Stig Schjolset, head of EU carbon analysis at Thomson Reuters, told Climate Home there had been little noticeable change in carbon trading or prices since the 2015 Paris Agreement. As China prepares for its launch and the EU works on a resuscitation policy, 196 countries at the UN are discussing plans for a new global market to help drive investment in poorer countries. Proposed under Article 6.4 in the Paris Agreement, the market could replace the billion dollar Clean Development Mechanism, which will likely close in 2020. Trust the extreme Greens to exploit a natural Earth event. Royal Dutch Shell cannot switch too quickly to producing renewable energy without risking its dividend payments and even its very existence, the oil and gas group’s chief executive warned. Major investors, including Dutch pension fund PGGM, have criticized Shell’s climate change policy in recent months, saying it should do more to mitigate climate change risks. Shell Chief Executive Ben van Beurden said that the oil and gas industry will nevertheless need to invest up to $1 trillion per year, even while meeting the U.N.-backed goal of curbing carbon emissions to limit the rise in global warming. Making a switch to other forms of energy would take time, Van Beurden said, adding that all the top 10 solar companies in the world represent $14 billion in capital employed and invested $5 billion in solar energy last year, but none had so far paid any dividends. “We cannot do it overnight (transition to renewables) because it could mean the end of the company,” he said. ***all those pension funds and a Capuchin priest no doubt have “climate expertise”, according to BBC! At the AGM here in Dallas, the company faces resolutions including one to appoint a board member who has a high degree of ***climate expertise. One motion asks the company to support the goal of limiting warming to below 2 degrees in line with the Paris climate agreement. Another asks Exxon to disclose how resilient its investments would be if policy measures to restrict warming to 2 degrees were implemented. This motion has a number of supporters including the Norwegian government’s pension fund, the world’s largest. ***now it’s a climate ACTIVIST…in the future! Exxon Mobil shareholders have rejected most proposals to increase reporting on climate change. More on the great Hydrocarbon Debt/Borrowing Superpower Phenomena (HDBSP) of our recent times. Didn’t see any Greens or Carbon Greens taking these energy superpowers down. I wonder what the entity or superior force is that can take down an entire planets worth of resource superpowers? It certainly aint no handful of Carbon Greens or deluded politician. I will meditate on this question over the weekend. The Saudis are doing this by not cutting production to keep oil prices depressed. Once the shale oil drillers are bankrupted, then they’ll ease production so oil prices come back up. But if they go bankrupt the assets will be sold to someone else who will pay a lot less for them than the previous owner. Sure prices might not be high enough to trigger new wells, but the existing wells will still operate. In all but the most extreme cases, the actual existing operations will still be making good cash, its just that the finance costs are not able to be covered. Go bankrupt to get rid of the debt associated with the owner and the same asset will be profitable at some price for the new owner. You see this all the time in mining. Often is is not until the mine has its second or third owner that it becomes profitable. They might change the mines’s cost structure a little bit, but the biggest thing they change is the capital on the books and its cost. The Saudi’s are mugs if they think that they can do this and affect things in the short term. Oil and gas are totally characterised by huge up front capital and tiny opex – huge fixed and tiny variable costs. They might change the owners of other countries oil and gas operations in the short term by pushing down prices to make covering the fixed cost difficult. But they can only reduce actual production by forcing the price down to below the variable cost of production. They will totally beggar themselves in the process of trying to do that. The strategy doesn’t work for large oil fields but can for shale since the reservoirs are small so you need move rigs, redrill and strike a new reservoir quite often – this makes opex quite large for shale oil. It is worth noting that in New South Wales and Queensland there are enormous reserves of Shale, most of it was quietly locked away within National Parks and few if any Australians complained about this natural resource being quarantined. But in the late 1800s or early 1900s Shale Oil was produced in various places including Newnes near Lithgow in NSW and the ruins of that enterprise can be visited today. The leftist denial of resources and related national prosperity opportunities is not in our best interests as a nation. These days it’s all about creditworthiness. The entity or country/corporation that can still secure a line of credit, typically from a lending industry like a privately owned bank for example, will dominate the remaining market until a single super-power creditor funded entititity is left standing. If only that. “Not so pretty. According to Zero Hedge, states with shale formation drilling have added 1.36 million jobs, while non-shale states have lost over 420,000 jobs. Even those states missing out on the shale benefits have flourished in a sense from the drilling, thanks to jobs only indirectly related to oil production, like a construction job building a new grocery store to serve a town’s booming population, for example. Ultimately, everyone in the U.S. benefits from fewer oil imports from outside the country. As I mentioned earlier, debt defaults have far reaching consequences for all of us. If these defaults become widespread enough, we could be talking about effects on things like bank deposits and international trade. I suspect the 16% (corporate) junk bond is higher than that. The derivatives overhang is a far bigger issue when it comes to global finances – the amount of money “created” by implied valuations easily outstrips the debt of oil companies. Their bankruptcies could trigger the debt recall that pulls the cards from the base of the derivatives house, however, and that would be a day of reckoning indeed. All these listed companies are small producers. Of course they are the first to go as they exist on much smaller profit margins and take more risks than larger companies. But then I suspect you know that and are posting to be contrary. Same law applies. The borrower who can borrow the most money determines the game. Both up and down the scale. What, by being cheap and efficient and working? It is amazing that CO2 is now pollution. Tell that to the trees. Besides, the French sold us a $28Billion desalination plant in Victoria which has not been used. Plus another three. So why not sell the government a working power plant and close it and get us to buy a new one for say $25Billion which costs much more to run? A solar/tide/wind/battery system. If governments want to spend far too much on electricity, the really smart operator is prepared to be paid to turn if off and take the cash. Why argue? All to reduce the world’s CO2 somehow not actually explained. Or to stop everyone drowning when nothing has changed in sea levels in thirty years. Everyone is invited to go to their favorite beach and look at the devastation or point out how their climate has changed. Our premier scientific body the CSIRO says we have suffered catastrophic climate change. Where? Darwin? Hobart? Your place? Fantasy stories and for fantasy money. French companies must love ignorant Socialist Australian governments and their compliant Australian socialist scientists. Prepared to pay billions for nothing, again and again. Mugs. Well if they start shutting down Hazelwood, then it’s FO to South Australia the next time the wind dies – we’ll keep our remaining dirty brown coal generated electricity (Loy Yang and Yallourn) and the Heywood substation can brown out so their grid crashes. You can add Tasmania in a drought if the Bass link breaks again. It seems Victoria’s ‘excess capacity’ has been the savior of two Green states. I mean unless the sub Bass straight link breaks again. I’m sure that could be arranged if Victoria was struggling to generate sufficient power for itself and the Tasmanian dams were low. But if Hydro Tasmania was to operate with prudent water margins again, a low wind, hot late evening in Victoria and South Australia would present the exact time to arbitrage from the their hydro reserves – the spot price would be guaranteed to hit the AEMO limit of $13,100 / MWh. Hillary Clinton is going to ban fracking. Why? Search me. Her e-mail didn’t mention that. You have to wonder how much the Saudis are donating to her campaign? Even Australia is donating handsomely, according to Larry Pickering, through DFAT and that is not able to be revealed. National security is at stake. You could check Hilary’s emails, tens of thousands of which mysteriously vanished like the 18 minutes of Nixon’s recording. I’m sure all those Saudi contributions to the Clinton Foundation were made for authentically charitable motives. Of course, donating to politicians campaigns is charitable by definition? What Pickering wants to know is how much we Australians have given to Hilary without our knoweledge or permission? The best estimate I have seen is $75 million with most of it provided during the Labor years in government after 2007, ended 2013. However the present government via the Minister For Foreign Affairs Julie Bishop has also provided funds to the Clinton Foundation. Meanwhile here one in every eight Australians live in poverty, many of them are homeless. It seems the view of our elected representatives is that any money they receive in taxes is their money, to do with as they please. Even the Liberals are channeling Michael Williamson of the HSU or Craig Thomson. What happened to representative democracy? I understand that gas export sales potential in Australia rivals the world’s biggest exporter, Qatar. Without any need for Oil imports USA could stop meddling in the Mid East. Trump may then be able to live with his desire to cut off all Mid East immigration. However what would happen to the US arms production industry? This is bringing all sorts of problems to the economists. The only reason I can tolerate the idea of Trump as Prez is I believe he will thoroughly rattle the leading “experts” in a lot of things – and they need rattled. He’s presented himself as a far-right nutter, then as a moderate nutter, and promised to un-Green the USofA; he’s portrayed by others as either evil incarnate or the savior of the righteous – and I don’t think he is, actually, either – he’s just an attention seeking man who loves the trappings of power, illusory or not, and he’s taken this opportunity to ram himself through the cracks of our political parties. And with the complete descent into idiocy that both parties are going through, the shattering of unity on either side, he’s won half the battle just by being there. I mean, he’s running against a socialist, which no matter how many 20-somethings (and maybe a few old hippies) think it is great, is anathema to most of the voting public, and the wife of an ex-Prez who is battling the powers that hate her (both parties have haters – they hate her, and her hubby) and are trying to convict her of -anything- they can, with only a dubious claim to unregulated and against-the-rules emailing to go forward with. He bumped the (fill in your epithet) Ohio Governor Kasich and T Cruz, a bible-speaking tea-partier from the Republican side with little effort, and poor Rubio stood no chance at all. If Trump can AVOID Palin as a running mate, he’s got it locked up. If he picks her, he’s still a going concern, but will have a bit of a battle, as Palin is not viewed well by the swing voters he needs. Sens. Lisa Murkowski (R-AK) and Jeff Flake (R-AZ) are requesting the U.S. Treasury Department produce the results of an investigation into abuses of a government program that grants clean-energy tax credits to renewable energy companies. The Treasury Department has been conducting the investigation for the past three years. Murkowski and Flake sent a letter to the Treasury Department’s inspector general in early April asking for the status of the investigation. Spanish green-energy giant Abengoa, which has received more than $2 billion in federal and state taxpayer support, filed for bankruptcy protection in the United States in late March. Saudi Arabia is seeking to revive its stalled solar-power program, scaling back more ambitious targets it set four years ago after making little headway in transforming the energy supply of the world’s biggest oil exporting nation. A second member of Australia’s Big Four banks has entered the green bond market, with the issue of a $500 million Westpac Climate Bond aimed at financing a $1 billion Australian-based clean energy portfolio, including low-carbon commercial buildings. Now, Fu focuses on the rapid changes of the arctic ice and, more specifically, black carbon. ‘It is still unclear where exactly black carbon comes from,” Fu explained. Once the data has been gathered to verify continuing results, the next challenge requires acceptance from the global population. In addition, she says, one-sixth of all illnesses and disabilities come from vector-borne diseases — which will rise if climate change is not checked. Those who will suffer the most are people in developing countries, she adds. “Now that you’re done with finals, help us meet the climate change test,” United Nations Secretary General Ban Ki-moon told Columbia University graduates last week. Gosh, boom and bust in the oil patch! Who would have though that would happen. Industrial flux is characterized by large numbers of participants going broke and a few become giants, absorbing the rest. We had,for example,a dot com bust. 90% went out of business. But some few survived and prospered. In the early days, there were hundreds of car companies. The consolidation continues to this day. The feature that has made debt problems disappear, for the most part,is compounding of growth, which dwarfs each generation’s debt with the next generation’s assets. Only economic systems which refuse to grow fail and regress. Allow a billion of the world’s poor to use enterprise to claw their way to the middle class,and our collective balance sheet will be healthy. Only the managed stultification of statism can create misery from the natural process of creative destruction practiced in free economies.